Ellery Queen's Mystery Magazine is an American digest size fiction magazine specializing in crime fiction, particularly detective fiction, and mystery fiction. Launched in fall 1941 by Mercury Press, EQMM is named after the fictitious author Ellery Queen, who wrote novels and short stories about a fictional detective named Ellery Queen. From 1993, EQMM changed its cover title to be Ellery Queen Mystery Magazine (without the 's), but the table of contents still retains the full name. Nicholas Solovioff painted this cover for a 1955 issue of Ellery Queen's Mystery Magazine. The popularity of the Ellery Queen radio and TV series increased interest in the magazine. Ellery Queen was the pseudonym of the team of Frederic Dannay and Manfred B. Lee, who had been writing under the name since 1929. EQMM was created to provide a market for mystery fiction above the common run of pulp crime magazines of the day. Dannay served as the magazine's editor-in-chief (although still under the name Ellery Queen) from its creation until his death in 1982, when managing editor Eleanor Sullivan succeeded to the post. Following her death in 1991, Janet Hutchings became editor of EQMM. It is... a compendium of every possible kind of crime story. Some of the kinds are more important than others, not all of the stories are masterpieces, and some will madden anybody who has a fixed idea of what the crime short story should be like. Yet the value of the magazine far transcends any criticisms that may be made of it. No doubt short stories would have been written if EQMM had never existed, but they would have been much less various in style and interest, and almost certainly much poorer in quality. Around 4 years after Ellery Queen’s successful debut, The Roman Hat Mystery, Dannay and Lee decided to produce a magazine that would publish only quality mystery fiction. Their first attempt, Mystery League, a monthly magazine for mystery fiction, debuted in October 1933, with Dannay and Lee as its only employees. What was unusual about Mystery League was that when most of the mystery magazines at the time were digests that would cut long novels into pieces before publishing them, Mystery League published only complete short novels, which helped to maintain the quality of the stories it published while leading to a higher selling price of 25¢. When America was still recovering from Great Depression, it was too high a price for most people to purchase a magazine. Therefore, the magazine ceased publication after only four issues, but its basic principle of publishing complete short mystery novels of high quality is inherited by Ellery Queen's Mystery Magazine. In the fall of 1941, Dannay and Lee gave their attempt to create a magazine for short mystery fictions a second try by creating the Ellery Queen's Mystery Magazine under the ownership of Lawrence E. Spivak of The Mercury Press. With little involvement of Lee, Dannay assumed primary editorial responsibility for the magazine, serving as its editor-in-chief from 1941 until his death in 1982.The magazine debuted as quarterly, and thanks to its popularity, it went bimonthly in the following year and finally went monthly in 1946. Just like "Mystery League", the first issue of EQMM contained 7 complete mystery stories from Dashiell Hammett, Margery Ellingham, T.S. Stribling, Anthony Abbot, Cornell Woolrich, Fredrick Hazlitt Brennan and Ellery Queen himself. Dannay admitted in his message to readers that “This first issue is frankly experimental. Our belief that a large public exists which impatiently awaits such publication can only be confirmed by that public.” In sharp contrary to Mystery League’s failure, the first issue is enthusiastically welcomed by the public, selling more than 90,000 copies, which is far beyond Dannay and the publisher’s expectation. Since then, EQMM has become the Amwtican leading magazine of the genre and is credited with setting the standard for the modern crime and mystery short stories and keeping short stories of the genre alive and flourish. Frederic Dannay served as editor-in-chief for EQMM for more than 40 years. As an editor, Dannay set his goal to establish a more respectful reputation for mysteries and keep the genre strong. Dannay explained his manifesto for Ellery Queen's Mystery Magazine as being to "raise the sights of mystery writers generally to a genuine literary form," to "encourage good writing among our colleagues by offering a practical market not otherwise available," and to "develop new writers seeking expression in the genre." To achieve his goal, Dannay worked hard to explore and represent every aspect of mysteries, expanding the variety of materials of EQMM to a great extent, while he believed his efforts also served to cater to the widest possible range of tastes and attract more audience. One of his major efforts was to find and publish stories written by big names with elements of crime or mystery, and as a result, more than forty Nobel and Pulitzer Prize winners, including William Faulkner, Ernest Hemingway, have works published in EQMM. Dannay also set a global orientation for EQMM, publishing works from writers all over the worlds, from works by English writers like Agatha Christie to first English translation of the work of Argentine writer Jorge Luis Borges. Besides, with his bravery and vision, Dannay pushed those boundaries followed by other magazines that days, publishing the first black detective story("Corollary" by Hughes Allison) in EQMM in 1948. The first EQMM short story contest was held in 1946. William Faulkner, the future Noble Prize winner, wrote a new story for the contest and won second prize, while the first prize went to Manly Wade Wellman. Faulkner was furious about his loss, and in a letter to his agent, he described the contest as "a manufactured mystery story contest". Many today admit that the story Faulkner written for the contest, "An Error in Chemistry", is not one of Faulkner best stories, and Dannay continued to publish works from Faulkner in EQMM, which in fact has helped Faulkner to gain in popularity among the general public. Several Spin-offs of the magazine came into being and died during this period. Overseas editions for US troops appeared in May 1945 and ceased publication in June 1946 after the end of World War II and the return of US troops. They were almost identical to the normal US edition of EQMM, with the only difference of a title "Special Edition for the Armed Forces Overseas" or "Overseas Edition for the Armed Services" printed on the cover. Since advertisements were not allowed in this kind of publication for the US army, the opening 3 pages of this edition, where the ads would typically be, were replaced with an additional story. Otherwise, an additional puzzle would be added at the end as a make-up. An Australian reprint edition started from July 1947 and ceased publication in November 1964, and a UK reprint edition was available between February 1953 and September 1964. Spin-offs that translated the magazine into other languages like Japanese, French, Italian, German were all once available, but all ceased publication eventually. After Frederic Dannay passed away in 1982, Eleanor Sullivan succeeded his place and began to serve as editor of EQMM. She was the managing editor of the magazine from 1970 to 1982, hand-picked by Frederic Dannay after an interview, and she has written many articles under a pen name for newspapers, magazines and books. During Eleanor Sullivan’s editorship, in 1985, The EQMM Readers Award began: it is an annual award selected by readers of EQMM of their favorite stories. Since then, it has become one of the most important awards of its genre. The first EQMM Readers Award went to Clark Howard. Eleanor Sullivan also served as editor-in-chief of Alfred Hitchcock's Mystery Magazine from 1975 to 1981, which helped to establish a closer relationship between EQMM and Alfred Hitchcock's Mystery Magazine. After Eleanor Sullivan became editor of EQMM and Cathleen Jordan became the editor of AHMM in 1982, they worked together to keep both magazines prosperous, and they often passed stories to each other to find a more suitable place for them. Janet Hutchings began her career as editor and publisher at the Doubleday Book Clubs, where she was given opportunities to read for the Mystery Guild, to which almost every mystery or crime novel waiting to be published in America would be submitted for possible inclusion. This experience greatly enhanced Hutchings’ passion for mysteries, and later she became Mystery Editor for Walker & Company and published a series of anthologies of stories from Ellery Queen’s Mystery Magazine. The connection gave her the opportunity of meeting Eleanor Sullivan at the EQMM 50th Anniversary Party in 1991 and later being interviewed as a possible successor to the magazine's editor. After Eleanor Sullivan died in 1991, she succeeded as editor of EQMM and has held the position since then. Hutchings inherited Dannay’s principle of the magazines, making quality the only standard while trying to maintain a great variety of the genre mysteries and a global focus. She described in an interview that her aim has always been to try to “make EQMM’s umbrella as wide as that of the genre”, and publish stories from the broadest possible range of mysteries. In 2003, Hutchings established the Passport to Crime department, which would translate works from other languages on a regular basis. Hutchings explained the change with Passport to Crime as the magazine scouting more actively for stories in other languages instead of just waiting for submission from foreign writers. During Janet’s editorship, EQMM embraced the trend of digitalization. In the early 1990s, EQMM converted to desktop publishing, and in 2011 Hutchings admitted that she now read submissions entirely on a Kindle. In 2009, EQMM’s podcast series began, which offered audience audio rendition of stories chosen from the magazine's archives. In the very same year, EQMM’s first major digital editions became available in addition to the traditional print format.Something Is Going to Happen, the EQMM editor’s blog, was launched in 2012, building a community where readers can discuss mystery and crime fiction actively and where EQMM editors, writers and readers can communicate more directly. Besides, the official website of EQMM offered information about the magazines to both subscribers and writers. In January 2018, EQMM launched its first web-only columns, "Stranger Than Fiction", on its official website. Written by Dean Jobb and scheduled to be updated monthly for free, the new column studies and presents true crime cases, a topic that EQMM used to lack. Because of its high editorial standards, EQMM was one of a relative handful of fiction magazines to survive the decline in American short-fiction publications from the 1950s to the 1970s. It is now the longest-running mystery fiction magazine in existence. Throughout its history it has actively encouraged new writers, and today, when most major publications will only accept submissions through literary agents, EQMM still accepts submissions over the transom (that is, unsolicited submissions through the mail). Unsolicited online submissions are now also accepted through an online submission manager as long as they follow the writers' guidelines. The magazine's "Department of First Stories" has introduced hundreds of new writers, many of whom became regular contributors. Ellery Queen’s Mystery Magazine has several distinguishing hallmarks, most of which were established during the days of Frederic Dannay’s editorship and have been maintained and strengthened since then. It is believed that these characteristics have helped EQMM to survive and flourish for more than 75 years while retaining its reputation as the leading periodical in the genre. From the creation of EQMM, Dannay was determined to make the magazine “a quality publication devoted exclusively to the printing of the best detective-crime short-story literature," making quality the sole criterion for inclusion in the magazine, and his principle is inherited by succeeded editors. Apart from the love of readers, the high quality of stories the magazine is proved by numerous awards won by stories first published on EQMM, and awards won by the magazine itself. EQMM has been nominated more than 370 times and has won over 110 awards, including awards from those most eminent mystery organisations in the world, for instance Agatha Awards, Anthony Awards, Arthur Ellis Awards, Barry Awards, Derringer Awards, Edgar Awards, International Thriller Awards, Macavity Awards, Robert L. Fish Awards, Shamus Awards, Spur Awards, and The Ellery Queen Award. EQMM has always striven to explore the broadest possible range of mystery, trying to present every aspect of the genre, which result in a great variety of stories, including hard-boiled stories, classic English mysteries, noirs, suspense, cozy mysteries and the work of literary writers, all available in the magazine. With publishing the best as its principle, EQMM has also helped to break down the barrier between supposedly “high” and “low” literary forms while blurring the boundaries of genres. As a result, EQMM contributes a great deal to American fiction since writers are therefore encouraged and allowed to write more freely, trying and combining different genres in their writing. The variety of magazines is also shown in its variety of contributing writers. As Dannay explained, the magazine “propose to give stories by big-name writers, by lesser-known writers, and by unknown writers. But no matter what their source, they will be superior stories.” While the magazines published works by great literary figures, it also started the Department of First Stories in 1949, which would publish works by new writers. On the other hand, the magazine has long enjoyed contributions from international writers, and its global orientation further expands the variety of the materials published in the magazine. EQMM had a global orientation from the very beginning with Dannay published works from writers from all over the world, introducing many international writers, including the great Argentine writer Jorge Luis Borges, to the English literary community for the first time with English translation of works by those writers. Dannay also ran a number of Worldwide Short Story Contests in the early decades of the magazine, bringing in submissions from all around the world. He even successfully published an “All Nations” special issue of EQMM in August 1948, which included stories from every continent but Antarctica. In 2003, current Editor of EQMM Janet Hutchings launched the Passport to Crime department, enabling a regular supply of translations from foreign authors. EQMM regularly publishes short fiction from established mystery novelists such as Edward D. Hoch, Jeffery Deaver, Michael Gilbert, Peter Lovesey, John Lutz, Ruth Rendell, and Janwillem van de Wetering. It has also published both new and classic stories from authors not generally considered mystery writers, including such diverse names as A. A. Milne, Stephen King, W. Somerset Maugham, P. G. Wodehouse, Joyce Carol Oates, Theodore Sturgeon and Phyllis Diller. EQMM regularly publishes two nonfiction sections: The Jury Box contains book reviews by Steve Steinbock and Blog Bytes contains reviews and updates of crime and mystery short fiction blogs by Bill Crider. Twice a year, former Jury Box columnist Jon Breen contributes a guest column. Cover artists included George Salter, Nicholas Solovioff and Norman Saunders. In 2007-2008, EQMM republished covers from the golden age of mystery fiction, circa 1940s. EQMM sponsors the annual Readers Choice Award, voted upon by readers. EQMM has always depended heavily on series characters and stories, such as the "Black Widowers" tales of Isaac Asimov, the "Rumpole of the Bailey" stories of John Mortimer, or the "Ganelon" stories of James Powell. Foremost among series authors was the late Edward D. Hoch, who created at least a dozen independent series for EQMM since his first story appeared in 1962. From May 1973 to May 2007, he had at least one original story in every issue of EQMM, a string that reached an unparalleled 34 years; in that same period he also had about 50 stories in EQMM's sister publication, Alfred Hitchcock's Mystery Magazine. 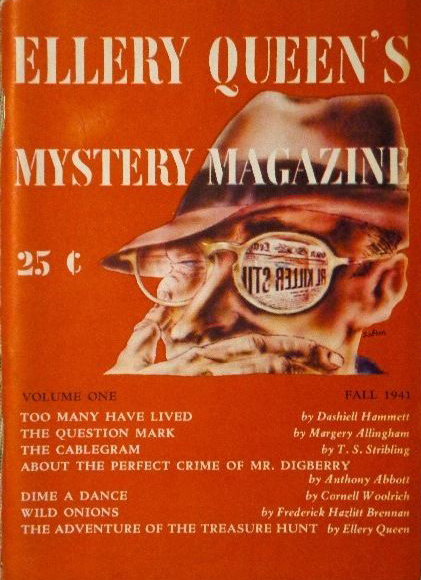 Ellery Queen's Mystery Magazine is published by Dell Magazines, Penny Publications, New York. Peter Kanter is the publisher. The magazine shares offices with other Dell magazines, including Alfred Hitchcock's Mystery Magazine. ^ "Magazine Data File". www.philsp.com. Retrieved 2018-01-21. ^ a b "Magazine Data File". www.philsp.com. Retrieved 2018-01-26. ^ a b c d e f "Whodunit? : a serial of aliasses - page 7 - Ellery Queen Mystery Magazine (1)". queen.spaceports.com. Retrieved 2018-01-26. ^ a b c d e f g h i j k l "History - About EQMM | Ellery Queen". www.elleryqueenmysterymagazine.com. Retrieved 2018-01-26. ^ "Contents Lists". www.philsp.com. Retrieved 2018-01-26. ^ "About Ellery Queen's Mystery Magazine | Ellery Queen". www.elleryqueenmysterymagazine.com. Retrieved 2018-01-26. ^ a b Grossberger, Lewis (1978-03-16). "Ellery Queen". Washington Post. ISSN 0190-8286. Retrieved 2018-01-26. ^ a b c d e f g h i j k l "EQMM HIghlights - About EQMM | Ellery Queen". www.elleryqueenmysterymagazine.com. Retrieved 2018-01-26. ^ a b "Mystery Magazine: At 70, Ellery Queen's publication still has a clue". Christian Science Monitor. 2011-08-19. ISSN 0882-7729. Retrieved 2018-01-26. ^ a b c d e "Ellery Queen's Mystery Magazine Turns 75 - The Millions". The Millions. 2016-10-26. Retrieved 2018-01-26. ^ a b c d "An Interview with Janet Hutchings, Editor of Ellery Queen's Mystery Magazine". The Thrill Begins. Retrieved 2018-01-26. ^ "The Case of the Disappearing Black Detective Novel". New Republic. Retrieved 2018-01-26. ^ Tramp, The Passing (2012-05-30). "The Passing Tramp: Faulkner vs. Wellman: The Ellery Queen's Mystery Magazine 1946 Showdown". The Passing Tramp. Retrieved 2018-01-26. ^ a b Duvall,J. (n.d.). "An Error in Canonicity, or A Fuller Story of Faulkner's Return to Print Culture,1944-1951". In Watson, J., Harker, J., & Thomas, J. G. (Eds.). (2017). Faulkner and Print Culture. Univ. Press of Mississippi. ^ ""The Case of the Unrecognized Editor" (by John Duvall)". SOMETHING IS GOING TO HAPPEN. 2017-06-21. Retrieved 2018-01-26. ^ "Ellery Queen's Mystery Magazine Subscription | Ellery Queen". www.elleryqueenmysterymagazine.com. Retrieved 2018-01-26. ^ "Issue Checklist". www.philsp.com. Retrieved 2018-01-26. ^ a b "Whodunit? : a serial of aliasses - page 9 - Ellery Queen Mystery Magazine (3)". queen.spaceports.com. Retrieved 2018-01-26. ^ Gaiter, Dorothy J. (1982-09-05). "Frederic Dannay, 76, Co-Author of Ellery Queen Mysteries, Dies". The New York Times. ISSN 0362-4331. Retrieved 2018-01-26. ^ a b c "Eleanor Sullivan, 62, Magazine Editor, Dies". The New York Times. 1991-07-15. ISSN 0362-4331. Retrieved 2018-01-26. ^ a b "Whodunit? : a serial of aliasses - page 8 - Ellery Queen Mystery Magazine (2)". queen.spaceports.com. Retrieved 2018-01-26. ^ "Major Mystery Prizes and Awards - About EQMM|Ellery Queen". www.elleryqueenmysterymagazine.com. Retrieved 2018-01-26. ^ "HIstory - About AHMM | Alfred Hitchcock Mystery Magazine". www.alfredhitchcockmysterymagazine.com. Retrieved 2018-01-26. ^ "From The Editor | Ellery Queen". www.elleryqueenmysterymagazine.com. Retrieved 2018-01-26. ^ "Podcasts - The Crime Scene | Ellery Queen". www.elleryqueenmysterymagazine.com. Retrieved 2018-01-26. ^ "About". SOMETHING IS GOING TO HAPPEN. 2012-03-15. Retrieved 2018-01-26. ^ "Stranger Than Fiction - The Crime Scene | Ellery Queen". www.elleryqueenmysterymagazine.com. Retrieved 2018-01-26. ^ "Awards - About EQMM | Ellery Queen". www.elleryqueenmysterymagazine.com. Retrieved 2018-01-26. ^ "CIS: 75 years of Ellery Queen Mystery Magazine » CRIME FICTION LOVER". crimefictionlover.com. Retrieved 2018-01-26.